It's a true story- "You can never go out of style once you find the perfect pair of denims"
And what happens when you find many of them?! Simply that, you are lucky enough and you need not stop your search because there are a number of pairs out there in the market waiting for you! 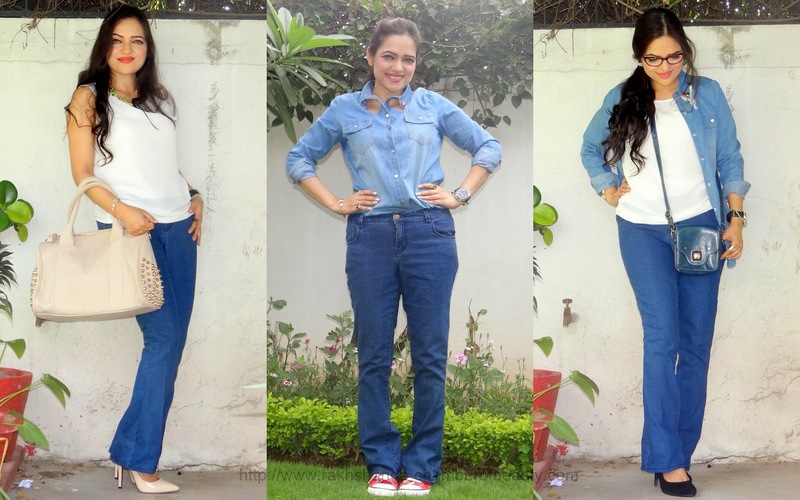 It's these very thoughts that inspire me to keep on collection various pairs of jeans from here and there and this time, it was a flare jeans! Flare jeans are back in vogue and the best thing about nowadays is that you can easily slip into, either a skinny one or a bootcut jeans without worrying about what is in fashion and what is not because both of them are! Jabong.com, which is probably the best online fashion megastore in India, not more than a year ago, exclusively launched some high street British and other international brands including Dorothy Perkins. Back in 2012, I had come across a floral pencil dress from Dorothy Perkins and it was the start of a love affair! When Jabong finally launched this brand, I was very excited to try out their products and there you go. I recently picked up a beautiful flare jeans and decided to try out three different looks with it which requires nothing but a pair of DP flare jeans, a basic white vest and a chambray shirt. The other things include some bags, heels, sneakers and accessories. Do let me know which looks is you favourite!? Now you can easily shop at Jabong through their mobile app- it took me two hours to shop from the app; 1 hour 55 minutes to choose something and another 5 minutes to checkout...haha!